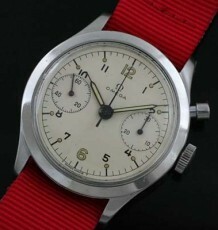 a great dress watch from Omega. 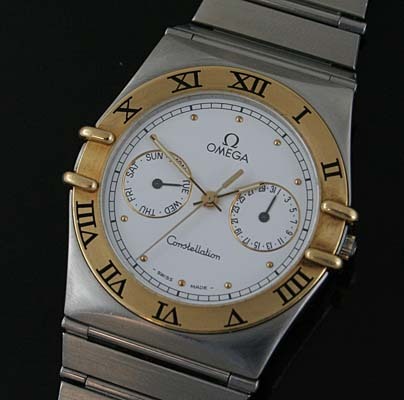 This 2 tone Omega Constellation Day Date, a modern day classic used watch that is in excellent condition. 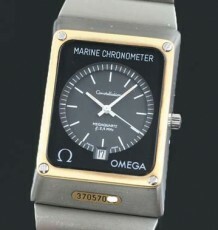 This classic used Omega Constellation dates to 1986 based on the serial number. The watch features a white dial with 2 enclosed registers that show the day of the week on the register on the left side of the dial, while the other register shows the day of the month. 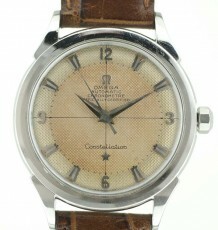 Aside from the gold dot hour markers on the dial, the watch has a gold plated bezel that has inlaid enamel Roman numerals indicating the hours. The dial is quite legible with the gold with luminous inlaid hands against the white background. 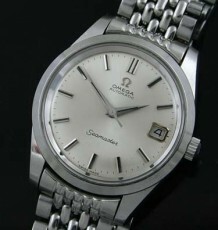 The Omega quartz movement was just reviewed and a new battery installed. The watch uses an original Omega integrated bar style bracelet which is currently sized for an 8.25 inch wrist but can be sized downwards. The case measures 34 mm wide by 38 mm long and 6.5 mm think.